Too little of a protein called neogenin results in a smaller skeleton during development and sets the stage for a more fragile bone framework lifelong, Medical College of Georgia researchers report. Neogenin doesn't make bone; rather, it forms a protein complex essential to turning on cartilage-producing genes, the researchers found. "Each cell type has a master gene. 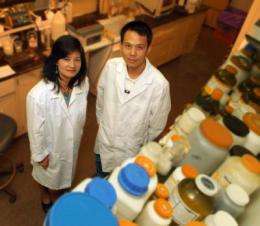 Neogenin is not that, it's more of a modulator," Xiong said. That's why, if it's mutated, like in the mouse, cartilage and bone formation is disrupted - not halted. It's also why neogenin could be a good therapeutic target for turning the tide on cartilage or bone loss that occurs in osteoarthritis, Xiong said. Skeletal development occurs early, which is why pregnant women need so much calcium. Initially the skeleton consists of soft bone or cartilage, which attracts blood vessels as well as the osteoblasts that replace most cartilage with hard bone over time. After birth, growth plates, where hard and soft bone meet, enable bones to lengthen and children to grow. After puberty, growth plates go away and bone hardens except for cartilage at the joints that eases movement and provides cushion. While bone cells continue to turn over, bone growth and loss should balance each other out after puberty due to osteoclasts - cells that break down and resorb bone. Diseases such as osteoporosis and osteoarthritis occur when osteoclasts start winning. Nutrition, inflammation and hormones are among the many factors that impact bone's status. "Every function in the body needs to be able to go up or down," Xiong said, noting that neogenin pathways are likely altered in disease. "I think in the disease condition this molecule could be changed. The pathways are altered, not eliminated, rather increased or decreased abnormally." Treating problems such as osteoporosis, iron overload and anemia, would require drugs that could keep protein levels high. Meanwhile, she wants to confirm neogenin's influence on cartilage function in adulthood. "In late-stage arthritis, the cartilage function may be completely disrupted but early in the disease process, maybe there is a window for stimulating this protein." More information: The research is also featured in a preview in Developmental Cell titled, "A Skeleton in the Closet: Neogenin Guides Bone Development.